Trust your Snoskred to schedule a pedicure for a day which does not exceed 14 degrees C. I struggle to wear flip flops on a hot summer day here in Australia. I parked as close as I could to the nail salon and walked as fast as I could. Going there was ok. While I was in there, the local August winds picked up. Walking back to the car was an icy adventure, made more difficult by the sun catching the sparkly in these toes and distracting me from the wind. 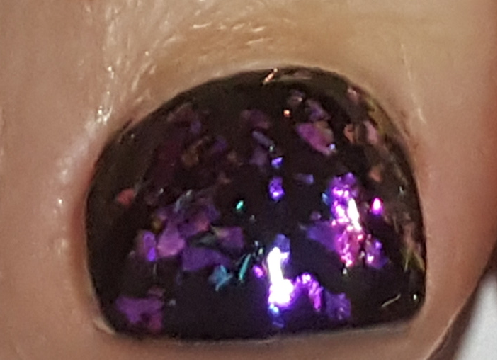 It is amazing what nail artists can do now – this is a black base with a large, thin glitter applied which makes it look like black opal with highlights of teal, blue, purple, orange and pink. Photos do not ever seem to do justice to these things. I don’t usually do pedicures other than when I am going on holidays. This year I am going to make more of an effort to take better care of my feet – not so much the painted toes part, but a regular pedicure and I have a referral to a podiatrist. My feet have lost nearly 2 sizes recently and it has changed where my foot is developing the thicker skin so I want to get some advice on that. 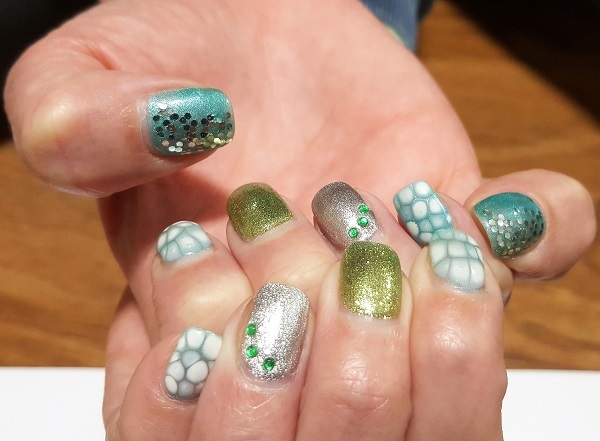 My past couple of manicures I have let my qualified nail artist do whatever she liked. It has been a fascinating experience, and I wasn’t really quite sure about this most recent artwork to begin with. I did not realise at the time she did this, but I’d had an outfit in my mind for a while and it was not until I put it on that I twigged – this matched my outfit perfectly! I like to think I mentally transmitted my outfit to her and she did my nails to match. My mind is blank at this time. I’m going to blame the cold weather. I just want to huddle up wearing all the clothes plus beanies and gloves. Fingers crossed my blog mojo returns and I can schedule some posts ahead of time again! ← Whoops I forgot to blog! I’m too hard on my fingernails to get a manicure, but those toes look AWESOME! I should find a podiatrist too, my feet are rather badly neglected. When she first did the fingernails I was not the biggest fan, until I went out into the sun and because she used a glitter underneath the white, the light caught the sparkles and I thought wow, that is not something I would have thought of doing, these are not colours I would pick for myself except for the thumb colour which is also under the fish scale and animal print white that she did there. The really amazing thing was on the first warm day we had, I pulled out this dress I have been waiting all winter to wear and it matched up perfectly, it had all the colours she had used. That was the moment I thought she had read my mind somehow. Fabulous pedicure – I tend to let my feet lie in fallow for the colder months (albeit I got them done for Darwin and had to suffer the thongs-in-winter thing as well). I love having painted fingernails but the slightest chip has me running for the acetone so I only get a day or so out of them!